To accompany creative persons – artists and those active in art – on their career path, to support them in a professional and competent way and help them achieve extraordinary artistic goals and visions, is the credo of my activity in context of K und K Wien. Petra R. Klose studied Drama and German Literature in Vienna. She was also trained in ballet, harp and elocution. She assembled her first theatre experiences at the Wiener Burgtheater and the Volksoper Vienna. 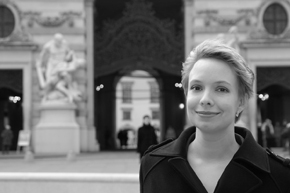 She followed courses in Public Relations and project organisation, among others at the Institute for Cultural Concepts and the University Vienna, where she currently writes her thesis on Edward Said’s theories focused on the example of Beethoven’s Fidelio. Petra R. Klose worked several years in the artistic administration of the Bregenz Festival and was active as dramaturge, assistant-director and production manager for the Wiener Festwochen, Bregenz Festival, Landestheater Bregenz, Konzerthaus Vienna, Triangel-Festival, Opéra National de Lyon, Feldkirch Festival, Laurent Delage Artists Management and the Sounding Jerusalem Festival. She appears as presenter for shows and classic music events and acts as casting and project consultant for music productions. In January 2011 she has been assigned as development coordinator by Al-Quds University to build up a College of Music in Jerusalem.